A recent report published by Infinium Global Research on mass spectrometry market provides in depth analysis of segments and sub-segments in global as well as regional mass spectrometry market. The study also highlights the impact of drivers, restraints and macro indicators on the global and regional mass spectrometry market over the short term as well as long term. The report is a comprehensive presentation of trends, forecast and dollar values of global mass spectrometry market. According to report the global mass spectrometry market is projected to grow at a CAGR of 8.0% over the forecast period of 2018-2024. Capabilities of mass spectrometry over other analytical technique is the trend in the mass spectrometry market. To detect unknown compounds, mass spectrometry endows increased sensitivity owing to reduced intrusion and superior specificity from characteristics pattern. Moreover, increasing use of advance technologies such as ion mobility spectrometry and capillary electrophoresis will fuel market growth in the upcoming years. Rapid growth of biopharmaceutical industry owing ton increasing demand for tandem and hyphenated technique is the key factor driving the growth of mass spectrometry market. Moreover, emergence of mass spectrometry as a masterdom tool used in pharmaceutical and health life science due to technological advancement in the field of mass spectrometry such as high accuracy, improved resolution and increased speed. 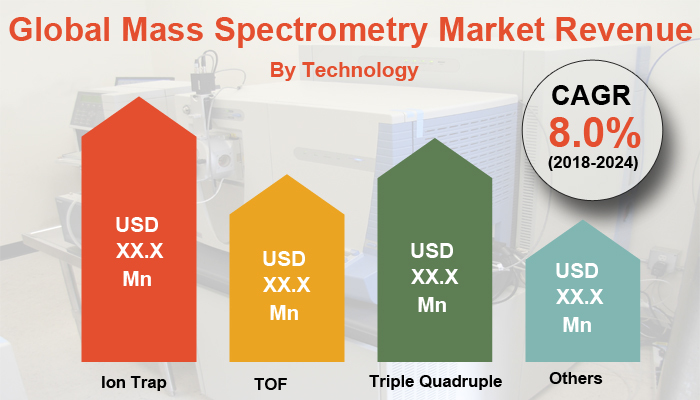 The report on global mass spectrometry market covers segments such as, technology and end user. On the basis of technology the global mass spectrometry market is categorized into ION trap, TOF, triple quadruple and others. On the basis of end user the global mass spectrometry market is categorized into pharmaceutical, industrial and others. The report provides profiles of the companies in the global mass spectrometry market such as, Bruker, DANI Instruments, Danaher, Thermo Fisher Scientific, Agilent Technologies, Hitachi High-Technologies, Alpha Omega, Bio-Rad Laboratories, AMETEK Process Instruments and Shimadzu. The report provides deep insights on demand forecasts, market trends and micro and macro indicators. In addition, this report provides insights on the factors that are driving and restraining the global mass spectrometry market. Moreover, IGR-Growth Matrix analysis given in the report brings an insight on the investment areas that existing or new market players can consider. The report provides insights into the market using analytical tools such as Porter's five forces analysis and DRO analysis of mass spectrometry market. Moreover, the study highlights current market trends and provides forecast from 2018-2024. We also have highlighted future trends in the mass spectrometry market that will impact the demand during the forecast period. Moreover, the competitive analysis given in each regional market brings an insight on the market share of the leading players. This report will help manufacturers, suppliers and distributors of the mass spectrometry market to understand the present and future trends in this market and formulate their strategies accordingly.